In 2008, the totl revenues for the American Israel Public Affairs Committee (AIPAC)-the leading organization in the United States supporting Israeli occupation and apartheid-amounted to $70,676,421. In that same year, the total revenues for the US Campaign to End the Israeli Occupation-the leading coalition in the United States working to change U.S. policy toward Palestine/Israel to support human rights, international law, and equality-amounted to $276,747, or just 0.39% of AIPAC's revenues. In some ways, this is a depressing statistic. In other ways though, it is inspiring as it shows how much we've been able to accomplish with less than 1/200th of AIPAC's budget. Kohr: "I'm not saying that these allegations have become accepted. But they have become acceptable. More and more they are invading the mainstream discourse, becoming part of the constant and unrelenting drumbeat against Israel." Kohr: "This is a conscious campaign to shift policy, to transform the way Israel is treated by its friends to a state that deserves not our support, but our contempt; not our protection, but pressured to change its essential nature." Kohr: "Incredibly there now is even an Israel Apartheid Week [cosponsored by the US Campaign] conducted in cities across the globe. Its aim, to build boycott, divestment, and sanctions campaigns as part of a growing global movement." Kohr: "But the campaign doesn't stop there. It is coming home right here to the United States. We see it already on our college campuses, America's elite institutions of higher learning, the places we've entrusted with the education of our children." Kohr: "No longer is this campaign confined to the ravings of the political far left or far right, but increasingly it is entering the American mainstream: an ordinary political discourse on our T.V. and radio talk shows; in the pages of our major newspapers and in countless blogs, in town hall meetings, on campuses and city squares. We're proud, and apparently AIPAC is very concerned, that we've accomplished all of this and more with only 0.39% of AIPAC's budget. Please consider making a year-end tax-deductible contribution today to support our work by clicking here. Because we've been able to accomplish so much with so little, it's clear that our movement is not lacking in determination, commitment, sophistication, or effectiveness. What we are lacking are the resources needed to counteract the work of AIPAC and other similar organizations and achieve our mission of changing U.S. policy toward Palestine/Israel to support human rights, international law, and equality. Please consider making the most generous year-end tax-deductible contribution you can today to support our work in the New Year and bring us closer to achieving our goal by clicking here. As our thanks to you, if you donate $50 or more, we'll send you or a friend a copy of US Campaign Steering Committee member Phyllis Bennis' new, updated edition of her book "Understanding the Palestinian-Israeli Conflict: A Primer". Just click here, make a secure on-line donation of $50 or more, and tell us where and to whom you'd like the book sent. The US Campaign will also gratefully accept a donation of any amount, so please give whatever you can today by clicking here. And if you can help us with a regular contribution, even just $5 or $10 or $15 every month, join our Olive Branch Club by clicking here. For a year-end newsletter detailing the US Campaign's many accomplishments this year, please click here. Thank you for your generous support of the US Campaign to End the Israeli Occupation and our best wishes to you for a New Year of peace and justice! PS: If you'd prefer, you can also make a tax-deductible contribution via credit card by calling our office at 202-332-0994 (we'll be open until 6PM Eastern New Year's Eve) or via check made out to US Campaign, PO Box 21539, Washington, DC 20009. Yesterday, we issued an action alert with five things you can do to support the Gaza Freedom March, including contacting the State Department, joining a solidarity action, and using our resources to take action in the media and with Congress. But as the Gaza Freedom March steering committee says, "the march itself is not supposed to be only a symbolic gesture, but rather a part of a series of events which will lead to the end of the siege, once and for all." Here are some more ideas for action you can take to hold the U.S., Israel, and corporate actors accountable for the destruction they have wrought in the Gaza Strip: 1) Boycott Motorola. Shrapnel with Motorola serial numbers were discovered by Human Rights Watch investigators at the site of the first Israeli air strike during "Operation Cast Lead," which targeted a police academy graduation and killed at least 40 police cadets. In addition, Motorola has the exclusive contract to provide the Israeli military with encrypted mobile phone technology. This means that every Israeli boarder guard manning a checkpoint inside of Palestinian territory or enforcing the Gaza blockade and every Israeli soldier who committed war crimes in the assault on the Gaza Strip takes their orders through a Motorola device. Finally, Motorola has close ties with Aeronautics Defense Systems (ADS), which makes drone aircraft that the Israeli military used during Operation Cast Lead. Watch the video below to see what sort of damage these remote-controlled killing machines can do, and then click here to sign the Motorola pledge and here to order a free organizing packet for promoting the Motorola boycott in your community. 2) Stop Caterkiller. US Campaign Steering Committee member Peter Miller of member group Americans United for Palestinian Human Rights put together this document which compiles mentions of armored bulldozers in the Goldstone Report on war crimes committed in the Gaza Strip. The Israeli military used remote controlled and weaponized Caterpillar bulldozers to destroy homes, roads, and agricultural land during the invasion of the Gaza Strip. Click here to read more, and then act to hold CAT accountable by sending an email to CAT management and organizing in your community. 3) Act to end U.S. military aid to Israel. U.S.-made F-16 fighter planes and Apache helicopters. U.S.-made white phosphorous shells. U.S.-made MK-80 bombs. These are just a few of the weapons provided via U.S. military aid that Israel abused to wreak destruction in the Gaza Strip. After Operation Cast Lead, Amnesty International issued a report entitled "Fueling Conflict" which outlined the role that foreign arms played in the 22-day assault on the Gaza Strip. The United States was by far the largest provider of arms to the conflict. Act to end U.S. military aid to war criminals by meeting with your Member of Congress and by signing up to attend our March 7-8 Grassroots Advocacy Training and Lobby Day. These national campaigns for justice and accountability are not possible without your participation and your support. Help sustain the important work of the US Campaign to End the Israeli Occupation by making a tax-deductible donation today. "I remember the day I first met Jamal Juma. He was speaking at a United Nations conference in 2003 about the damage being done by Israel’s Wall. The audience was shocked: Many had heard that Israel had started carving a Wall in the West Bank in 2002, but they had no idea it could already be seen from outer space....Now Jamal is in jail. Israel’s occupation army detained him on December 16. After interrogating him, they brought him back home, handcuffed, and searched his house while his wife and three children watched. Then they took him off to prison....Jamal is the third anti-Wall activist to be arrested in the last few months. Their arrest is an Israeli acknowledgement of their success, at great personal cost." "Moreover, the Stop the Wall Campaign made a strategic decision to link to the movement for boycott, divestment and sanctions (BDS) against Israel. The first Stop the Wall activist to be arrested was Mohammad Othman on his return from Norway, where his advocacy efforts contributed significantly to the Norwegian Pension Fund decision to divest from the Israeli military giant Elbit Systems....Israel still believes it can act with impunity. It will only stop if there is a cost to its human rights violations. Appeals to the Israeli authorities to respect due process are not enough, as Omar Barghouti put it in a call to redouble efforts for BDS. Israel will only change if it "gets the message that its arrest of civil resistance leaders will only intensify the already massive BDS campaigns against it." Find out how you can "intensify the already massive BDS campaigns" against Israeli occupation and apartheid by clicking here. "More than 1,000 people from around the world were gathered here on Tuesday for a solidarity march into Gaza despite Egypt’s insistence that the Gaza border crossing that it controls would remain closed to the vast majority of them." "Egypt allowed 100 protesters from around the world to enter the Gaza Strip for a solidarity march with Palestinian residents. Another 1,200 activists from more than 40 countries who wanted to participate in the Gaza Freedom March remained in Cairo on Wednesday. "Two buses with 100 delegates on board left this morning for Gaza," Ann Wright, an organizer of the Gaza Freedom March, told the news agency AFP on Wednesday. The buses were set to enter Gaza through the Rafah border crossing, the only entry point into Gaza that does not require going through Israeli territory." "We support any decisions taken by the Gaza Freedom March Coordination Committee about the entry of just 100 of 1400 delegates into Gaza instead of all the delegates presently in Cairo....The decision to send 100 delegates, however, seemed too divisive for the growing solidarity campaign with the Palestinian people. The unity of the global solidarity campaign is of utmost importance for us, the besieged Palestinians of Gaza. We have repeatedly argued that the march itself is not supposed to be only a symbolic gesture, but rather a part of a series of events which will lead to the end of the siege, once and for all." "We flatly reject Egypt’s offer of a token gesture. We refuse to whitewash the siege of Gaza. Our group will continue working to get all 1362 marchers into Gaza as one step towards the ultimate goal for the complete end of the siege and the liberation of Palestine” said Ziyaad Lunat a member of the march Coordinating Committee." Here's video of activists from the Gaza Freedom March reject Egypt's offer to allow only 100 of the delegates through the border to Gaza. Their decision is cheered by the other delegates who were not allowed to go to Gaza, and they chant "All or none!" (thanks to Palestine Video for posting this). Listen to Rep. Baird at the end: "There will be a cost in dollars, in aid, in support, if some fundamental changes don't happen." It's not too late to arrange a meeting with your Members of Congress when they are in their home districts during the winter recess and let them know that you agree with Rep. Baird. Click here to find out more. Want tips on pressuring Congress, opportunities to network with other organizers, and the chance to meet with your Members of Congress in their D.C. offices? Register today for the US Campaign and Interfaith Peace-Builder's Grassroots Advocacy Training & Lobby Day, March 7-8, 2010. "Yesterday we joined the people of Gaza, the people of all of Palestine, and allies around the world in remembering the anniversary of the inhuman and illegal Israeli attacks that stole the lives of more than 1,400 mothers, fathers, daughters, and sons last December and January. And, in a manner far too appropriately suited to remembering an unfathomably vicious massacre and the preposterous silence of the American and Egyptian governments, we freedom marched in circles throughout the streets of Cairo." "Surrounded by police, an international group of human rights advocates staged a demonstration at a UN installation in Cairo on Monday after the Egyptian government denied their request to enter Gaza....Former EU parliament vice president Luisa Morgantini, Filipino Senator and president of the Transnational Institute Walden Bello and others held a news conference outside the UN building in Cairo in hopes to negotiate their entry in Gaza via the Rafah crossing. Another member of the Gaza Freedom March group, Holocaust survivor Hedy Epstien, 85, declared a hunger strike in protest of Egypt’s decision. More than 600 others joined the demonstration at the UN building...."
"An 85-year-old Holocaust survivor was among a group of grandmothers who began a hunger strike in Cairo on Monday to protest against Egypt's refusal to allow a Gaza solidarity march to proceed. American activist Hedy Epstein and other grandmothers participating in the Gaza Freedom March began a hunger strike at 1000 GMT. "I've never done this before, I don't know how my body will react, but I'll do whatever it takes," Epstein told AFP, sitting on a chair surrounded by hundreds of protesters outside the United Nations building in Cairo." "This was a small but moving action in which small groups of us moved to the bridge and tied notes to the bridge recording our solidarity with the people of Gaza and our sorrow at the horrors inflicted on them a year ago in the three weeks prior to the inauguration of Barack Obama. The action was schedule to unfold from 11am to 1pm. I was there from 11 to 12:30 or so and saw no security force interference during that period [the memorial was apparently broken up by security forces later on-ed.]. 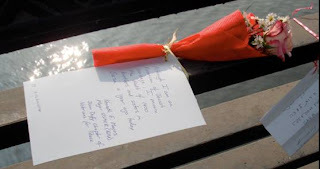 Pictured below is the flower and the note that I tied to the bridge. This is not to say that there were no security forces around. I don't believe I have ever been in a city where police are more visible -- and that includes Hanoi, Ho Chi Minh City, and Beijing." Prior to 2007, and average of 70 truckloads of exports left Gaza everyday. For the past two years, that number has been zero. Only 35 categories of items are allowed into Gaza. That is, only 35 types of products are allowed in to the 1.5 million prisoners. The figures highlight the complete failure of governments to act on behalf of justice and peace. When governments--whether Egyptian, Israeli, or U.S.--fail to act, civil society steps up to the plate. This time around it's no exception. As 1400 human rights advocates work to highlight the siege of Gaza in Cairo, people around the world are organizing. Some are contacting the Egyptian government. Others are organizing solidarity actions. Here in the United States, it's important to link these solidarity actions with our ongoing national campaign to change U.S. policy toward Israel/Palestine to one that respects international law, human rights, and equality for all. Take action in the media, with Congress; and in the streets. Link your actions with ongoing campaigns against Caterpillar (whose bulldozers were used heavily in Operation Cast Lead), Motorola, Ahava, and U.S. military aid. It's long past time for the siege to end. It's long past time for the Israeli occupation to end. It's long past time for apartheid to end. "An Israeli organization handing out cash to soldiers for disobeying orders has been collecting tax-exempt donations from American donors in apparent disregard of United States tax law." "After years of building slowly, the boycott, divestment and sanctions (BDS) movement has gained real traction. The BDS conference at Hampshire College in November — which drew students from 40 campuses — marked a watershed in anti-occupation activism in the United States. BDS proponents — many of them Jewish — are picking up a time-honored, non-violent protest tool as they seek meaningful action against the 42-year-old occupation. Charges that these are “antisemitic” efforts to “delegitimize Israel” mischaracterize a multifaceted movement for human and civil rights. As BDS keeps growing, the Jewish community is going to have to grapple seriously with the issues this movement raises." Check it out here, and leave comments on the article (thanks to US Campaign Steering Committee member David Matos of member group Carolina Peace Resource Center for spotting this one). You can use our media action resources and campus BDS resources to get more involved. Amy Goodman and Juan Gonzalez of Democracy Now! interview Gaza Freedom Marchers Hedy Epstein and Medea Benjamin: Find a Gaza Freedom March solidarity event near you, and check out our resources for taking action in the media and your local community. "[T]he army shoots at unarmed demonstrators, and when they try to show the world the violence used against them by collecting presenting the remnants – they are persecuted and prosecuted. What’s next? Charging protesters money for the bullets shot at them?" Hate to say it, Adv. Lasky, but we know exactly who's getting charged for the bullets and tear gas canisters shot at protesters--not to mention the bombs and missiles dropped on Gaza. It's the U.S. tax payer! In FY2001-2006, the United States provided $2,515,080 worth of .22-.50 caliber ammunition to Israel--26,619,524 bullets. In FY2007, the U.S. provided $4,181,378 in ammunition--28,672,145 bullets. In FY2007 alone, the United States gave Israel 121,991 pieces of teargas and riot control agents valued at $1,654,536. Organize against U.S. military aid by signing up as part of our Congressional District Coordinators Network. Israel steps up campaign of repression. We can step it up our campaign, too! "Clearly, the strategy is to arrest all of the leaders and charge them with incitement, thus setting an extremely high "price tag" for organising protests against the subjugation of the Palestinian people. The objective is to put an end to the pro-peace popular resistance in the villages and to crush, once and for all, the Palestinian peace movement." The question for us, of course, is how do we respond? What actions can we take in solidarity with our Palestinian and Israeli allies who are working nonviolently for justice and peace? If you haven't already, check out the call to action from Stop the Wall. Once you've done that, here's a couple of suggestions of actions you can take in your local community: 1) Your tax money helps pay the bill for the munitions that are used to suppress nonviolent demonstrations. In FY2001-2006, the United States provided $2,515,080 worth of .22-.50 caliber ammunition to Israel--26,619,524 bullets. In FY2007, the U.S. provided $4,181,378 in ammunition--28,672,145 bullets. In FY2007 alone, the United States gave Israel 121,991 pieces of teargas and riot control agents valued at $1,654,536. Organize against U.S. military aid by signing up as part of our Congressional District Coordinators Network. 2) Much of the Palestinian nonviolent resistance is directed against the building of the Apartheid Wall and settlements on Israeli land. Caterpillar bulldozers are used to build both the Wall and the settlements, not to mention uprooting Palestinian agricultural land and demolishing Palestinian houses. Motorola provides surveillance equipment for settlements, as well as communication equipment that is likely used to coordinate night raids in villages like Bil'in. Products such as Ahava are produced in settlements built on Palestinian land. Engaging in boycott, divestment, and sanctions campaigns in your local community is exactly the kind of solidarity called for by Palestinian civil society--and, as Omar Barghouti has said, it might just be the "most consequential form of protest" against the repression on nonviolent resistance. 3) The repression of nonviolent protest, the separation of populations, the imprisonment without trial--all of these violations of human rights fall under the crime of apartheid. Educate yourself and your community about the crime of apartheid and how it applies to Israel's treatment of the Palestinians by clicking here. 4) Finally, incorporate messaging about military aid, BDS, and apartheid into your solidarity events with the Gaza Freedom March, coming up next week. Israel is stepping up its campaign of repression. Let's show the Israeli military--and our Palestinian and Israeli partners in the struggle for a just peace--that we can step up our campaign, too. Help us do just that by making a tax-deductible contribution to the US Campaign to End the Israeli Occupation today! Leaders of two US Campaign member groups have published articles on Gaza in the Huffington Post today. Linda Frank of North West Middle East Peace Forum shares diary entries from Khulood Ghanem, a 27-year old resident of Gaza City who kept a diary during the entirety of last year's 22-day Israeli assault on the Gaza Strip. Click here to read the piece, entitled "Living Under the Bombing of Gaza." Medea Benjamin of CODEPINK Women for Peace writes about the Egypt's threat to block the Gaza Freedom March and vows that the march will go on. Click here to read her piece. For more on the Gaza Freedom March and US Campaign member groups making news, check out our earlier post, "Gaza Freedom Marches On." "The Gaza I have been visiting for the past twenty-one years bears little relation to the dehumanizing imagery to which it has been reduced by the mainstream media. The Gaza I know is home to friends and strangers who are as welcoming and humane as they are resilient and determined to achieve their freedom. They have maintained their humanity despite enduring a brutal forty-two-year-old Israeli occupation that has cost them the destruction of their homes, land, economy and future and the loss of more than 4,000 lives since the dawn of the twenty-first century....In late December, to mark the first anniversary of Israel's war, some 1,200 internationals from forty-two countries will be doing what they can to get things moving in the right direction. They intend to enter Gaza from Egypt to participate in the Gaza Freedom March." The Gaza Freedom March, which is endorsed by the US Campaign to End the Israeli Occupation, is facing a new challenge this week, as Egyptian authorities are threatening to close the Rafah border with the Gaza Strip for the next several weeks. March organizers have vowed that this obstacle will not prevent them from entering Gaza. Click here to read more and take action. In other Gaza news, 16 major humanitarian and human rights organizations have issued a report calling the international community to task for a year of inaction following the devastating Israeli attacks on Gaza a year ago. And Gisha, the Israeli Legal Center for Freedom of Movement, has launched a new blog with updated information about the status of Gaza border crossings. You don't have to go to the Gaza Strip to advocate for an end to Israel's illegal and immoral siege. Join a solidarity action in your community, or use the action resources on our website to organize your own. And remember--the blockade of Gaza is only one aspect of Israel's policy of occupation and apartheid that we have to confront. Incorporate calls for boycott, divestment, and sanctions and for freedom for leaders of Palestinian nonviolent resistance into your solidarity actions. Meet with Members of Congress about the humanitarian effects of the siege and how U.S. military aid is misused by Israel. And take action in the media to draw attention to the conditions in Gaza one year after "Operation Cast Lead," and continuing U.S. support for Israeli violations of Palestinian rights in the occupied West Bank, Gaza Strip, and East Jerusalem.